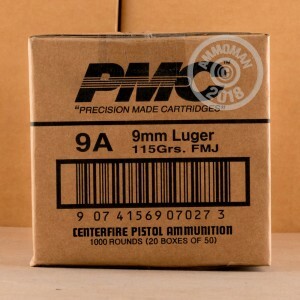 This pack of 300 rounds in 9mm Luger (6 boxes of 50 rounds each) is an inexpensive but dependable choice for your next range session. 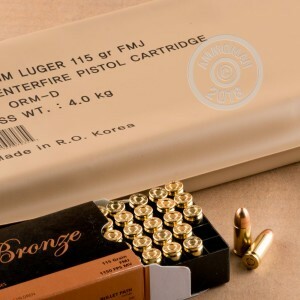 These rounds use a light 115 grain full metal jacket bullet, non-corrosive Boxer primers, and reloadable brass cases. A standard pressure load, they produce mild recoil and pressures and should work great in any 9mm Parabellum pistol. 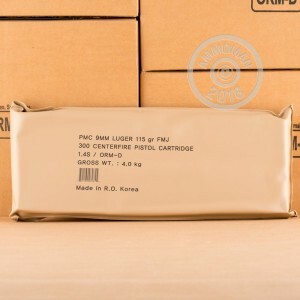 Manufactured in South Korea by a top defense contractor, PMC ammunition uses house-made components and electronic quality control systems to ensure consistency and reliability. 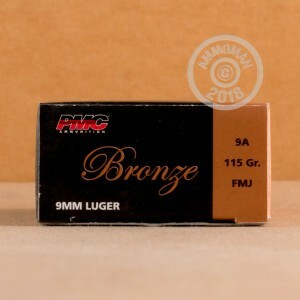 PMC Bronze rounds are highly popular among US shooters due to their quality, availability, and low price. Add this pack (or two!) 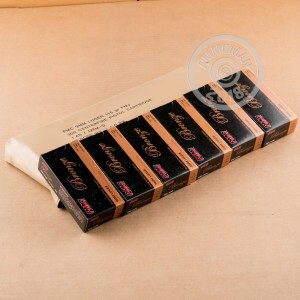 to your cart, or buy any other items totaling $99 or more in an order, and get free shipping from AmmoMan.com. It's a great deal that gets better the more ammo you buy!